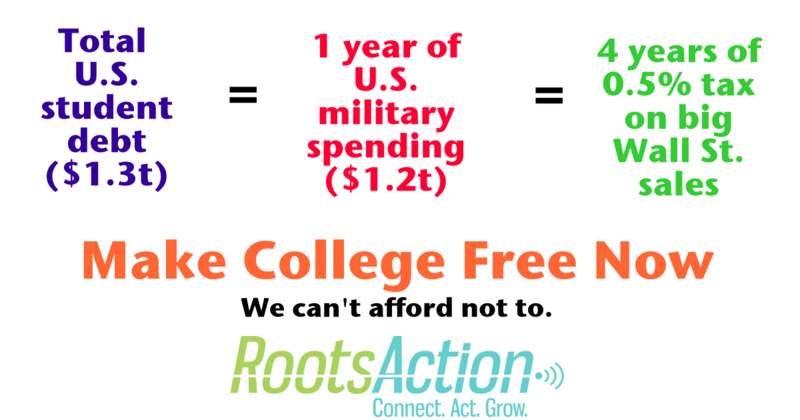 The United States has the money to make college free, as some other nations do. The U.S. is rolling in money. It's just not being used to provide the globally recognized human right of education. As a constituent, I urge you to make college free. The United States has the money to do this, as some other nations do. Please cosponsor and support S.1373, a parallel House bill, and any similar legislation to begin fulfilling the legal obligation to provide the basic human right to education. Please support steps in that direction, including H.R.2429, which protects students from tax liability when a school closes or an agreement is reached with the Consumer Financial Protection Bureau to keep a school open.